Manifest your Intentions, Clear your Blocks. Do you set intentions / goals and they just fly out the window? Do you wonder why your manifesting is not quite working out? Do you have a hard time following through on things? Now is the time to Identify, Clear and Release them in order to Manifest our Intentions. Evaluate what is important, bring forth your highest vision, and make your dreams a reality. PAYMENTS ARE THROUGH PAYPAL OR WITH CREDIT CARD. AFTER PURCHASE PLEASE CHECK YOUR EMAIL FOR WELCOME LETTER WITH COURSE INFORMATION. YOUR INVESTMENT IS ONLY $47, that’s an $80 SAVINGS!!! 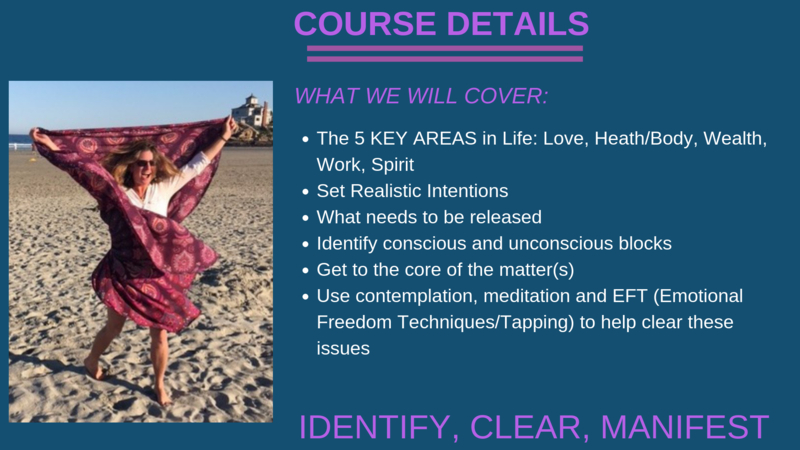 Don’t miss out on this life-changing, transformational course. Join me from the comfort of your own home where you can proceed at your own pace. The recordings are yours to keep and listen to anytime!